Pierre Konowaloff has lost a bid to secure the return of some art confiscated nearly a century ago. Konowaloff is the successor in interest of a Russian art collector who had his art collection confiscated in the 1917 Russian revolution. The 2nd Circuit held the claim is barred by the act of state doctrine, upholding a 2011 dismissal of the claim in the Federal District Court for the Southern District of New York. In its simplest form, the doctrine protects the U.S. Executives dealings with foreign nations by requiring claimants like Konowaloff to seek a remedy with the state doing the expropriation. The doctrine states that separation of powers requires that federal courts not challenge the validity of decisions by recognized foreign sovereign governments. In 1911, Ivan Morozov purchased the work. Morozov was a Russian art collector, and lost this work and another Van Gogh currently held by Yale University after the Bolshevik seizures during the Russian revolution. Konowaloff is the great-grandson of Morozov. The Soviet Union in 1933 needed funds and decided to deaccession (if I can use that term in this context) the painting. The paintings were purchased by Stephen Clark, an American who bequeathed the Cézanne to the MET and the Van Gogh to Yale University. Yale decided to initiate a declaratory suit, getting ahead of the lawsuit, and is still ongoing. So the Bolshevik-era claim has been extinguished. One wonders though if the way courts treat the act of state doctrine in this context may be different from the ways it might treat foreign ownership declarations of other works of art. That’s a question I don’t have the answer to. It may be there are peculiar aspects of the doctrine. But on balance this seems like nations are given the benefit of the doctrine when it comes to situations where museums have long possessed these objects, but they aren’t given the same advantages in other repatriation cases. That may be because of problems baked-in to the doctrine, or not. I’m not aware of any direct act of state doctrine argument which bends for claimant-nations, it seems primarily to assist current museums attempting to fend off suits arising from Nazi-era takings. 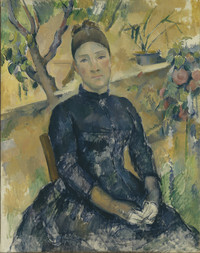 Philip Boroff, Met Museum Sued Over Cezanne Painting Stolen by Bolsheviks From Collector, Bloomberg, December 8, 2010. The Norton Simon Museum’s “Adam and Eve” also were among the Goudstikker-owned works the Allies repatriated to Holland after the war. But the Dutch government subsequently sold them to an heir of Russian nobility who claimed that his family, the Stroganoffs, had a prior claim on them, having owned them before they were seized by the Bolsheviks during the Russian Revolution. Goudstikker bought them at an auction in 1931, then lost them to the Nazis. Whether “Adam and Eve” had belonged to the Stroganoffs during the early 1900s is part of the dispute between Von Saher and the Norton Simon Museum. The museum’s founder and namesake bought them from the Stroganoff heir for $800,000 in 1971; the museum has had them appraised at $24 million. In the “Adam and Eve” case, a federal judge in Los Angeles ruled in 2007 that Von Saher had filed her claim too late to meet the three-year statute of limitations for suing to recover allegedly stolen art, and that a 2002 California law suspending the statute of limitations for Holocaust-era art-restitution claims filed through the end of 2010 was unconstitutional because it intruded on the federal government’s sole prerogative to set foreign policy and war policy. The U.S. 9th Circuit Court of Appeals agreed in 2009 that the California law was unconstitutional, although it directed the trial judge to reconsider whether Von Saher nevertheless has a legitimate claim under the regular statute of limitations. Von Saher has appealed to the U.S. Supreme Court in hopes of reinstating the voided state law. The high court indicated in October that it is considering whether to take up the case, but first it asked the U.S. solicitor general to file a brief giving the federal government’s view. Kaye, the Von Saher attorney, said the brief hasn’t been filed yet. So the Getty has voluntarily returned the work to the dispossessed heir, and should be praised for doing the right things. Yet that decision surely was much easier given that the painting was never displayed. The Norton Simon has decided to fight to retain possession of its disputed works—which are more valuable, and have a much more complex history, touching both the Bolshevik revolution and World War II. Mike Boehm, Getty Museum: Getty Museum agrees to return painting looted by Nazis, L.A. Times, March 29, 2011, http://www.latimes.com/entertainment/news/la-et-getty-painting-20110329,0,2892909.story (last visited Mar 29, 2011). The Met has been sued by Pierre Konowaloff over this work. The claimant argues the work was stolen from his great-grandfather during the Russian Revolution, Ivan Morozov. Morozov was a Russian textile merchant, who collected a number of works by Cezanne. His works were zeized in 1918, and Morozov’s home was made a state museum. This work was apparently purchased by Morozov in 1911, and he owned the work for seven years. In contrast, the Met has had the work for the last 50 years. The work was donated to the Met in 1960 by Stephen Clark, who purchased it from a gallery in 1933. This suit, if successful, would really extend the limits of restitution claims further into the past to touch not just the Second World War, but the first one as well. Konowaloff is currently defending a declaratory judgment suit brought by Yale University over the disposition of Vincent Van Gogh’s “The Night Cafe”. Yale is seeking a court determination that it is the rightful owner of that work, which would preclude a sale by the claimant. Philip Boroff, Met Museum Sued Over Cezanne Painting Stolen by Bolsheviks From Collector, Bloomberg, December 8, 2010, http://www.bloomberg.com/news/2010-12-09/met-museum-sued-over-cezanne-taken-by-bolsheviks-from-collector.html (last visited Dec 10, 2010). When the Red Army entered Germany at the end of World War II, it seized 2.3 million objects including paintings, sculptures, and other works of art. At the time of this writing in 2009, the bulk of those objects are still in Russia. In addition to hundreds of thousands of pieces that belonged to German citizens and German museums the Russians hold paintings that the Nazis had stolen from all over Europe. Many of the works in question have been kept in locked rooms in the basements of museums since the end of the war. Although there were some encouraging signs that the art might be returned, or at least allowed to be displayed, with the end of the communist government, it does not appear that Russia is considering a large scale return of the art at this time. To the contrary, the Russian government has long held that the art is restitution for the destruction and theft of Russian art by the Nazis, and passed a law in 1998 that declares that the art is state property. This article explores the international legal remedy for procuring that art from the Russian government. “[U]ntil every one of those paintings, prints, sculptures, tapestries, and artifacts is returned, it will be impossible for us to walk through most of the world’s museums and galleries without wondering if we are staring into the haunted face of the spoils of war.” At the outset, a conclusion: favorable verdicts are obtainable, but the successful conclusion of litigation will only be the beginning of the exceedingly difficult task of enforcing a verdict against an obstinate and neo-nationalistic Russian government. Yale University has been sued in U.S. District Court in Connecticut by Pierre Konowaloff who alleges a work by Van Gogh—”The Night Cafe”—was confiscated from his great-grandfather during the Communist revolution in Russia. The action is a counter to Yale’s earlier suit. Yale initially brought suit in March, seeking to pre-empt Konowaloff’s claim. In Yale’s initial suit in March, they argued courts should not undo the property revolution of Russia. Russian law would seem to prevent these kind of claims as well. Back in March, Richard Lacayo noted that Konowalof’s grandfather—Ivan Morozov was “was one of the two outstanding Russian collectors and patrons of modern art early in the 20th century.” The suit, Yale University v. Konowaloff, 09-466, U.S. District Court, District of Connecticut (New Haven), will determine whether this work was seized unlawfully during a Communist takeover of Russia in 1918. A similar issue recently arose in the UK with the recent dispute over the Royal Academy display of “From Russia: French and Russian Master Paintings 1870-1925 From Moscow and St. Petersburg”. Russia nearly backed out of the deal. The display required an act of Parliament to grant special immunity to prevent the works from being claimed by descendants of the original owners from whom many of the works were summarily seized during the Bolshevik revolution. 2009 must be the year claimants to Yale’s cultural heritage decided to pursue their claims, because of course this suit follows soon after the Republic of Peru’s suit filed in December over artifacts taken from Machu Picchu.